We're seeing plenty of companies step up to offer their employees parental benefits. That's amazing news...but why aren't new dads on board? If it seems like most of the new dads you know are heading back to work just days after they welcome their babies...well, you might be on to something. But if new research is any indication, it might not be because they don't have access to paid paternity leave. More and more companies are stepping up to offer family-friendly policies to their employees. Fatherly's annual "Best Places to Work for New Dads" report indicates that the average number of weeks new dads are entitled to has stretched from four to 11 in just 24 months—at least, within the companies honored on Fatherly's "best places to work" list. It's high time we realize that adjusting to parenthood isn't just something moms need to shoulder: In this day and age, fewer families are following the deeply gendered model that once reigned. Mothers have successful careers, and fathers do more inside the home. Yet when it comes to the amount of time moms take off vs. the amount new dads do, there's still a huge gap. Sure, fathers don't breastfeed their kids or have to recover from childbirth, but that doesn't mean paternity leave doesn't benefit families in major ways. If Fatherly's findings are any indication, companies are offering up more time than they did in the past. But as CNBC pointed out, not all men take advantage of this. There appeared to be several factors at work here: For one thing, the companies that offer strong parental leave policies tend to hire a selective few—and because of that, these progressive policies become available to a privileged minority. Or maybe dads are seeing their own friends and peers head back to work and are feeling pressured to do the same. There's also the fact that, while we can measure a workplace's policies or a general shift in the marketplace, we can't quite quantify the cultural notion that exists where paternity leave is concerned. It's entirely possible that men aren't taking advantage of their time off because they feel like it'll put their jobs in jeopardy or make employers question their work ethic. The fact that many Americans don't take full advantage of their vacation days is well-documented...is the same line of thinking at work where paternity leave is concerned? 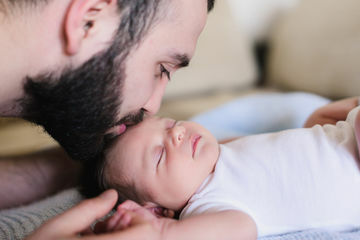 While we don't know the exact percentage of new dads who utilize all their paid days off, we do know that maternity and paternity leave aren't as common as they need to be. The progress reported is a sign of positive change—and hopefully a combination of corporate responsibility and societal reassurance will lead us to a better place for families.